11th – 13th Dec 2017, University of St-Andrews. We are pleased to announce that the H2FC SUPERGEN is holding its 2017 Researcher Conference from midday 11th Dec – midday 13th Dec 2017 at the University of St-Andrews. Join us at the most significant annual gathering of international hydrogen and fuel cell researchers in the United Kingdom. Bringing together the entire hydrogen and fuel cell research community, inspiring collaboration and driving innovation. Hydrogen and and Fuel Cells are gaining an increasing level of attention from both industry and governments in the UK and around the world. This conference will include insights and observations on the status and future of the industry, through presentations from key representatives working in government, industry and academia. The discussions will cover not only the research developments and challenges but also new and exciting opportunities for hydrogen and fuel cell research. Our list of key-note speakers will be publicised soon. We call for PhD students and early career researchers, along with academics and industrialists to send a half to one page abstracts for the conference detailing their research and giving an overview of the results they wish to present by Sunday 15th October 2016. Please submit your abstract using the submission tab below! Please indicate if your submission is for an oral or poster presentation. We encourage PhD students, who are not giving a oral presentation, to join the 3-minute-thesis (3MT) competition, summarising their research in a three minute presentation. There will be prizes for the best poster and 3MT presentation. Click here for the book of Abstracts! Please click for the Conference Programme! Please choose the appropriate registration option (required). All fees include the Conference dinner organised for 12th Dec 2017. Are you happy to have your email included on the delegate list? Finally, to help us program the streams, please let us know which Conference Theme session you are most interested in attending. You will be directed to Imperial College London website for payment. After payment you will receive an automated receipt, however if you would also like an official receipt from the conference, please contact us at h2fcsupergen.conf@imperial.ac.uk. 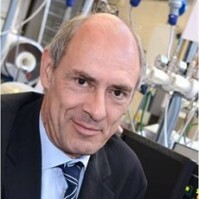 Prof. Robert Steinberger-Wilckens is director of the research Fuel Cell and Hydrogen group and the Centre for Doctoral Training Fuel Cells and their Fuels, which is run by the universities of Birmingham, Nottingham, and Loughborough, Imperial College, and University College of London. He works and has worked in many areas across the fields of renewable energies, energy efficiency, fuel cells, hydrogen production and distribution, as well as electric vehicles. Currently, his main areas of interest include Solid Oxide Fuel Cells, high temperature electrolysis (SOE) and reversible fuel cells (SOC) with methane synthesis, intermediate temperature polymer fuel cells, and market introduction of fuel cells and fuel cell vehicles. He has a total of over 200 publications in journals, books, and conference proceedings and is a regular peer reviewer for a large number of journals, as well as international funding programmes and publishing houses. He is member of the strategic advisory bodies for EPSRC, the EU Fuel Cell and Hydrogen Joint Undertaking, and the European Fuel Cell Forum. No 10 on the map here! Travel: Visitors to St Andrews have a number of options when it comes to travelling to the town. Located on the east coast of Scotland within the Kingdom of Fife, St Andrews can be easily reached from a number of nearby cities via public transport, road and private transfers. International visitors have a choice of airport to fly into, all of which have good links with the town. For information about getting to St Andrews please see here! A range of hotels are available at St Andrews. We have arranged for accommodation to be available at discounted prices. This list can be found here! Please note the booking deadlines, which are set for early November 2017.